We’re in the home stretch, only 2 more sleeps! With the hustle of last minute shopping, gift wrapping and baking, coming up with clever entertaining ideas often gets pushed to the back burner. I have a catering business so when I entertain most assume it is going to be the bomb dot com of yummy eats. But lets be real here, its kinda like the mechanic with the broken car, or the carpenter that hasn’t gotten around to putting the baseboards in their house, when it comes to yourself the priority dwindles. Time is precious, and I need to have a few ultra delicious tricks up my sleeve. Something that says “I love my guests as much as my clients” so today I wanted to share this little secret weapon with you, the Easiest Brie Appetizer you’ll EVER make. 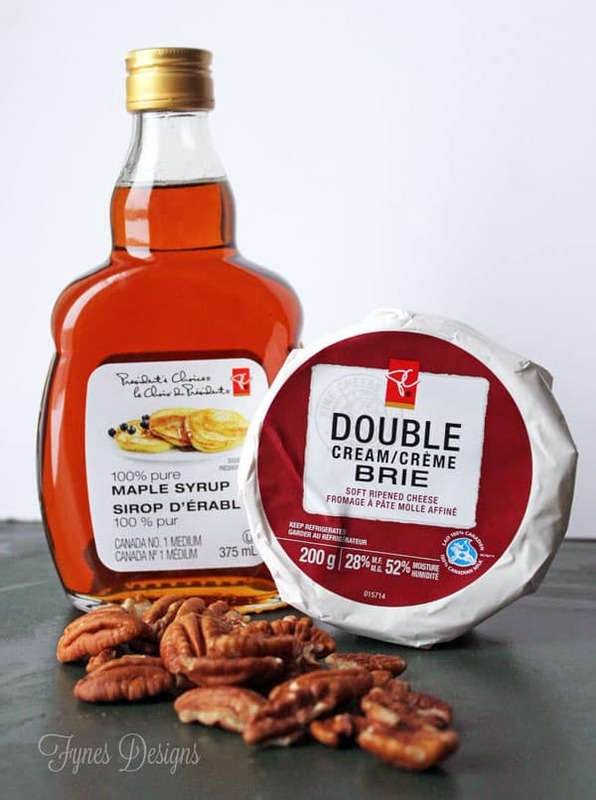 PC Maple Syrup (1/4 cup), PC double Cream Brie (200g halved), pecans (a handful), a big knife, and a small baking dish, sliced baguette or crackers. Using your big knife cut the wheel of brie in half (this way you don’t have to saw through the tough outside rind to get to the yummy cheese, and when people want more (which they will) you’re prepared for round 2. Put the brie in the baking dish and drizzle with Maple syrup. 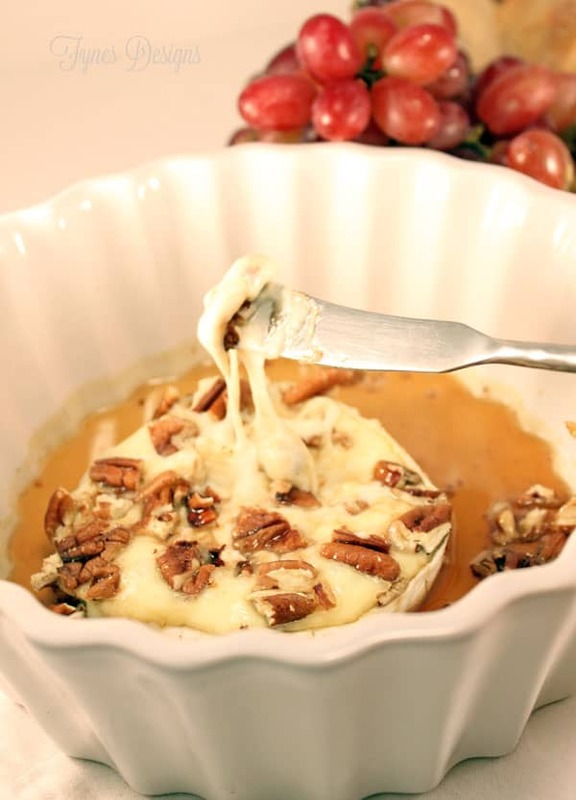 Chop the pecans with the big knife and throw on top of the brie. Slide it in the oven for 20 mins (on 350) until the cheese is bubbly. Serve with slices of baguette. Spread on and dip slices into maple syrup run off. 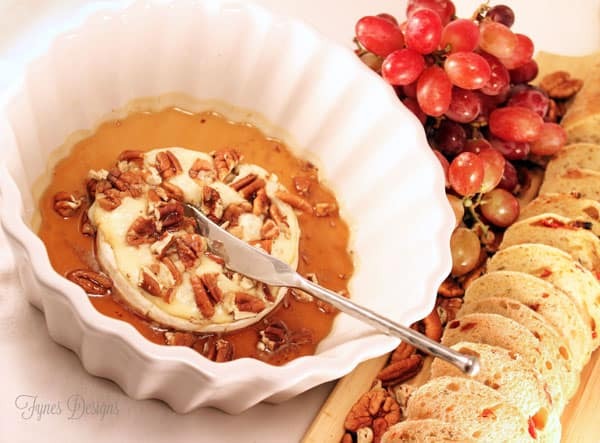 Can you believe how easy this Brie Appetizer is? I promise your guests will be wowed! Plus guess what? If Maple isn’t your flavour, PC offers Brie Aux Petits Fruits. A wheel that you just pop in the oven and drizzle with an included sweet berry topping- too easy! President’s Choice® brand has everything you need to prepare a traditional festive feasts, or easy holiday entertaining so you can spend less time in the kitchen and more time with family and friends! Check out the Insiders report in store for loads of great entertaining ideas! Do you have a simple go-to recipe when you entertain? I’m always looking for yummy quick treats. Disclosure: PC provided my ingredients for this post. Recipe, ideas, opinions, are (as always) my own. Merry Christmas to you too Jenny! Hope you have loads of fun with your little one! I’ll be making this one! Merry Christmas to you and your family, Virginia!